My pal was in town and we had plans to visit the photography museum and beer museum in Ebisu, and decided that while in Ebisu we should seek out a delicious bowl of ramen. I had brought my guide, so after a bit of flipping through, we thought that Afuri was close by and looked good, so decided to go for it. I had kind of been secretly hoping to go back to Tsukumo to have their Hokkaido Cheese ramen, but at Afuri shio is the order of the day. The trip to Afuri was a bit further back in time than some of my other ramen shops visits on the list, so I was still feeling a bit questionable about my feelings towards shio. 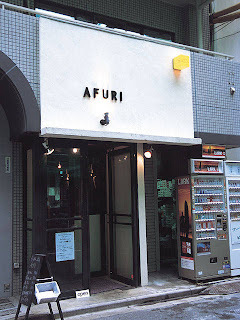 Even with a map, it took a little while to find Afuri, since it was tucked away on a side street and the sign looked more like that of a bistro than that of a ramen shop. There was no line, but the counter was pretty much packed - definitely a chic place catering towards a young, modern, and health conscious crowd. It was all cream colors and hardwood inside, with sunlight coming in through a small garden in the back. 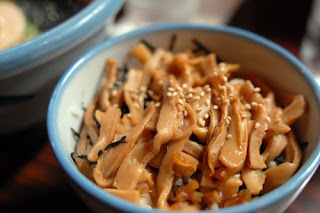 Apparently Afuri is a pretty well known name on the ramen scene and is famous city-wide. After a few bites I could see why. My instincts wanted me to dislike this ramen - it was fancy, it was shio, it was assari, there were actual raw green vegetable shreds on top. 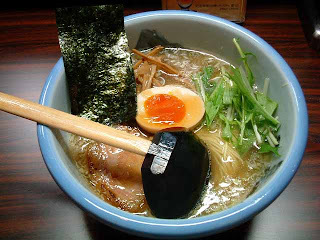 But I just couldn't hate Afuri's ramen, it was too tasty. The shio soup was light and flavorful and the ajitama egg was perhaps the most perfectly boiled egg I have ever eaten, nice and orange inside with the yolk just drippy enough. The noodles were straight and medium thin. Besides the ramen, we got a side of take (bamboo) rice. The menma were tender and flavorful and delicious, with the juices dripping down to flavor the rice. Afuri is the kind of place were you can tell just by looking that all the ingredients being used are extremely high quality. I'd say I'd be back to Afuri, but I've already been back - two days later my pal wanted Afuri one more time before hopping on the train. I was too hungover to eat any ramen, but I had a few sips of the yuzu (citron) shio soup and it was extremely delicious. There are more ramen shops I need to try in Ebisu, but I'm sure the craving for Afuri will strike me again at some point.